Go Go’ers, this weekend, March madness means Westside whistle-wetting and lots of it. Starting tonight and (with two seshes on Saturday afternoon and evening), a pack of East Coast wine enthusiasts (translation: eager beaver winos) have brought Second Glass Wine Riot, their bev-of-choice bacchanalia, to Santa Monica Place: the first stop in a country-wide tour that will presumably leave hangovers and smashed and sodden dreams in its wake. Yes, Go Go’ers…your spring has now sprung. The Second Glass boozers fans of the grape will be pouring over (and poring over) 250 wines from all over the world with “Wine Intelligence Units” (think vine-savvy geeks in t-shirts, not stuffy suits in shades) standing by to answer your drunken but undoubtedly-still-cogent questions. There’ll be “Crash Course Wine Seminars” and Second Glass mobile apps available so you can note all pertinent deets about your imbibing education and, of course, your actual imbibing. Ms. Go Go would wager, however, that sampling 250 wines might make you more likely to use the app to note how many sammies from the Coolhaus treats truck you can stuff in your mouth while recording said awesomeness in the thoughtfully provided photo booth. Ms. Go Go speaks hypothetically, of course. 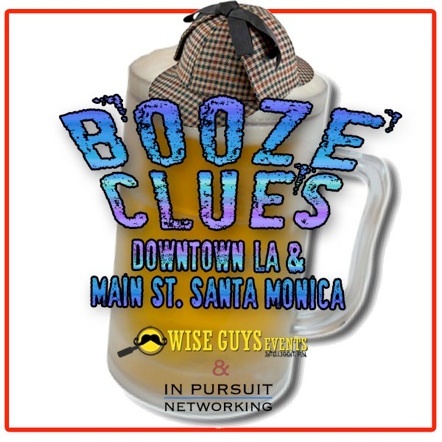 If you’re the kind of dedicated booze hound who likes to limber up prior to a drinking event (or just needs some open-air, post-Riot hair of the dog), consider the also-SaMo-based Booze Clues, sponsored by Wise Guys Events. During this pub-crawl-with-a-“purpose” (not that you need one beyond the cocktails), you and a team of friends (or attractive, like-minded, alcoholic strangers) will put your befuddled heads together over drinks (your ticket includes one at each of the four destinations), puzzles, secrets and challenges. Hopefully, the latter will not include solving the puzzle of where you left your phone, the secret of your ability to talk coherently (and even charmingly!) to attractive teammates/strangers while inebriated, and the challenge of staying upright while you do all of the above. Go Go’ers, let the March madness multi-tasking begin.